A team of astronomers from the Harvard-Smithsonian Center for Astrophysics have completed a series of computations that will shed new light on some of the modern questions in astrochemistry. The ubiquitous clouds of gas and dust found between stars provide the natal material for new stars and planets. 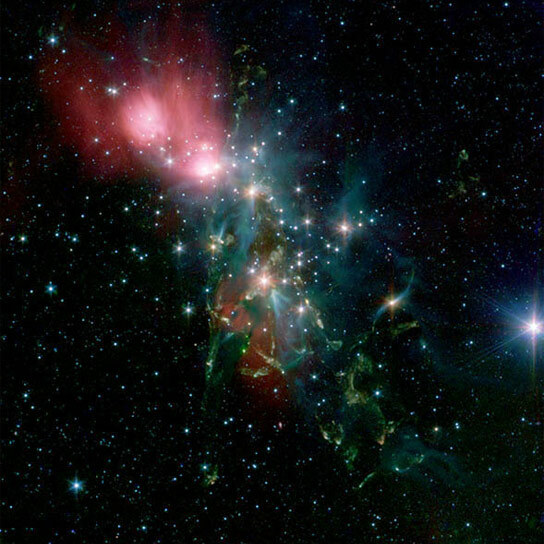 These clouds are also dynamic factories that produce many complex molecules thanks to their rich environment of stellar radiation, dense gas, and dust grains. The grains (most of which are silicates, analogous to sand) act as miniature chemical laboratories. Atoms and molecules from the gas condense onto their surfaces and then interact with one another to form even more complex species. Water, a particularly abundant species, tends to form a layer of ice on the grain surfaces. One of the outstanding set of questions in modern astrochemistry involves the processes that enable newly formed molecules to come off the frozen grains and back into the gas, where they can disperse, radiate, and can be measured with millimeter telescopes. Understanding these processes would also help scientists better characterize the physical conditions in the locations where the molecules are detected. New stars host complex environments that including circumstellar disks and dramatic outflows of material in the form of narrow jets. The jets disrupt these environments, and where they collide with the ambient interstellar medium they produce shocks. Astronomers have long known that these shocks, moving at comparatively modest velocities of about ten kilometers per second (about 22,000 miles per hour) can expel surface molecules from grains and prompt the molecules to radiate. In fact, shock velocities are often much faster than this. The shocks can also fracture the grains, thereby injecting silicon oxide molecules (SiO) into the gas. The longstanding problem has been an inability to quantify accurately the shock processes. CfA astronomer Sven Van Loo and four colleagues have completed a series of computations that for the first time describe in a self-consistent manner how shocks disrupt grains, and that seems to agree with the observations of gas abundances in many regions. The scientists find that at speeds of 20-25 kilometers per second the grain surfaces are completely vaporized, returning all the ice to the gas as water vapor. Then, once the surface has been completely eroded, the grains begin to release SiO into the gas. Millimeter telescopes have found that SiO gas emission is a ubiquitous signal around young stars. The new research will help scientists determine the kinds of shocks responsible for these regions, in turn shedding light on the jets and young stars that produce them. 1 Comment on "CfA Astronomers Shed New Light on Dust Grains"
That, by any standards, is totally mind blowing information. I am amazed by this universe that we float around in and devour any such data on this and related topics. Every day I learn something new and I am thankful to sites, such as this one, for the information that it provides.